I hope eclipse season treated you well and brought you the best kind of shifts…if you are struggling with navigating any changes in your lives (whether good, or bad) then please check out my latest podcast episode which is all about handling change. If you happen to live in Los Angeles, or are visiting, then please join me this evening for a Soulstrology Soundbath at Wanderlust in Hollywood. 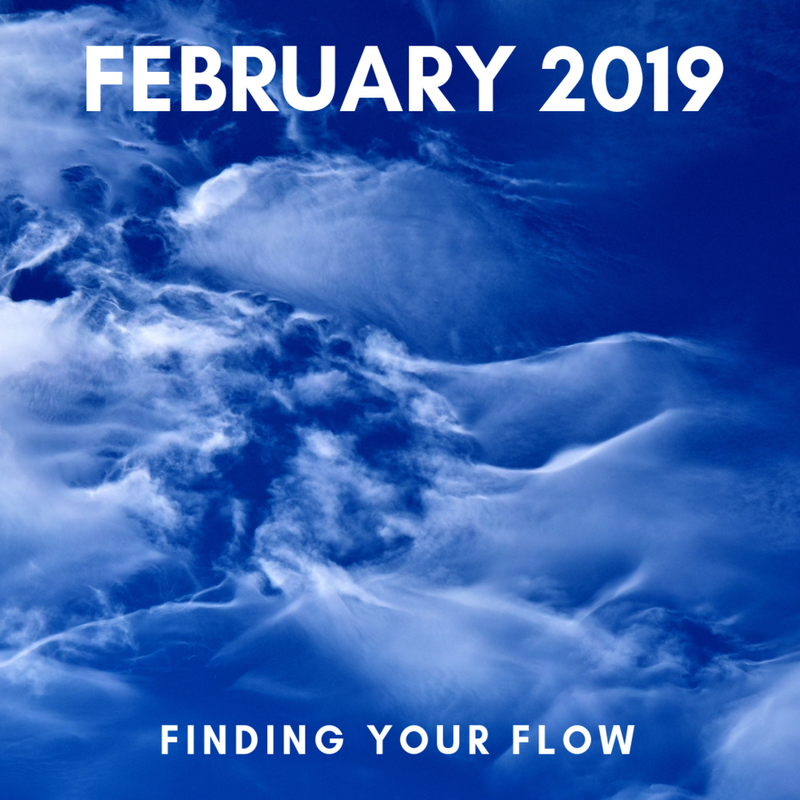 Onward now to February 2019, a month where the cosmos asks us to find our flow…. As you all know, 2019 started with a bang with January seeing eclipse season as well as all the planets in forward motion with Uranus turning direct. We should have all felt the power of the celestial energies. For some this may have been more internal; an emotional, mental, spiritual shift. For others this may have been more external; a sudden opportunity or sudden change. A swift ending or new beginning. For others (like yours truly) it may have been a combination of both. Either way our worlds would have been if not shaken, then definitely stirred. As we embrace February, we are in Aquarius season, asking us to align with the element of air. Three weeks into February, Pisces season starts with the ruling element of water. Post eclipses, with air and then water as the ruling elements of February, this month we are each asked to find our flow. Finding our unique flow will look different to each of us as we are independent souls on separate journeys living out differing chapters in the books of our lives. My flow and yours could not only look totally different but they may be be completely incongruent. And that is totally fine. In fact, it is good. The only important thing this month is to tap into your unique flow, one that resonates with your truth and serves your mind, body and soul. Finding your flow means finding what works for you and aligning with that. It means checking in when you are perhaps forcing yourself to do something because you ‘should’ or because everyone else is doing it, you have FOMO or you’re coming from a place of lack. That isn’t flow. That is forcing. Flowing is when you feel soooo good because you are living in alignment with your truth and higher self. It is flowing in a way which truly serves you - mind, body and soul. As February starts, take the time to get quiet. To meditate, to journal and ask yourselves what flowing means for and to you. When you imagine flow, imagine grace in action, graceful, flowing, harmonious energy. It is an energy available to each of us, it is about living in alignment and this month, our only real job is to tap into that energy and to live it. Wishing you all a beautiful start to this new month. May we each embrace our unique flow and may this bring us deep fulfillment this month and beyond. February 1: Mars in Aries square Pluto in Capricorn - tense but powerful aspect, can be super productive but watch out for tension and conflicts. February 2: Venus in Sagittarius trine Uranus in Aries. Positive flowing aspect. Good for creativity, self-expression, financial and love matters. February 3: Mercury in Aquarius sextile Jupiter in Sagittarius. Positive, flowing aspect. Good for the mind, communication, creative matters and thinking outside the box. February 7: Sun in Aquarius sextile Jupiter in Sagittarius. Positive, flowing aspect. February 7: Mercury in Aquarius sextile Mars in Aries. Positive flowing aspect. February 9: Mercury in Aquarius sextile Uranus in Aries. Positive flowing aspect. Powerful for creativity, self-expression, communicating your ‘voice’ or a ‘message’. February 12: Mars in Aries conjunct Uranus in Aries. Powerful aspect, can be productive with sudden changes, but has a very volatile aspect. Watch out for conflict or accidents. February 17: Venus in Capricorn sextile Neptune in Pisces. Positive, harmonious flowing aspect. Great for creativity, romance. February 17: Sun in Aquarius sextile Uranus in Aries. February 18: Venus in Capricorn conjunct Saturn in Capricorn. Powerful positive aspect. Great for formalizing romantic, creative and financial matters. February 19: Mercury in Pisces conjunct Neptune in Pisces. Powerful aspect, can be great for creativity, spirituality but watch for being overly idealistic, too rose tinted and not thinking or expressing yourself clearly. February 22: Mercury in Pisces square Jupiter in Sagittarius. Powerful aspect but be mindful of thinking or communicating in a way that is unrealistic, or over the top. February 22: Venus in Capricorn conjunct Pluto in Capricorn. Very powerful aspect for matters of love, creativity, finances to experience great transformation. February 23: Mercury in Pisces sextile Pluto in Capricorn. Positive, harmonious, flowing aspect for the mind, communications. February 27: Sun in Pisces sextile Mars in Taurus. Positive, flowing aspect.